South Florida's Experts in Recreational Towing. American R.V. features towing products and installation services for Blue Ox, Roadmaster, Demco, Remco, M&G Engineering, US Gear, Brake Buddy, Overbilt, Versahaul, Hydralift, Curt, Reese, and Drawtite, along with a wide variety of R.V. and trailer parts, accessories and installation services. American R.V. and Marine was initially established in the early 1970's as Art's Welding, owned and operated by Art Yarosh. In the R.V. industry infancy most vehicle hitches and tow systems were custom made by a welding specialist who would fabricate hitches for those looking to tow their Airstream trailers across the country or build customized tow systems for those looking to hit the northern hills with their 4x4's and motorcycle carriers for those adventurous trips to Daytona. As the R.V. industry evolved, and the demand for recreational towing systems and toy haulers grew, so did Art’s Welding. In the 1980 Arts’ Welding was revamped and expanded to American R.V. 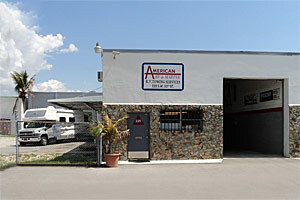 and Marine, relocating to its current location and it quickly became South Florida's leading towing experts. American R.V. and Marine today is one of the largest installers of towbars, base plates and supplemental braking systems for tow vehicles, motorcycle lifts/carriers, Fifth Wheel, Gooseneck and trailer hitches in South Florida. American R.V. and Marine has dedicated the last 30 years to helping friends and families experience the joys of the R.V. lifestyle. 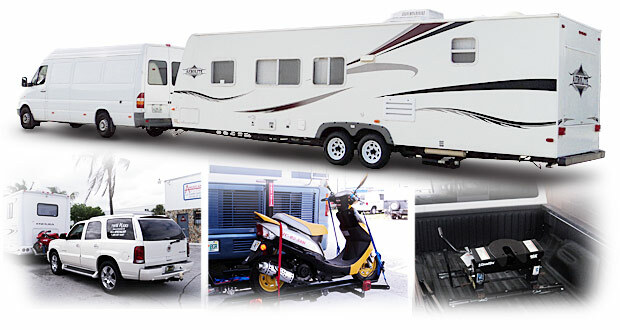 Our outstanding reputation for excellent service and value has served us well, so whether you're towing your favorite car, your brand new boat or simply hauling your motorcycle, you can rely on us to supply you with the parts, accessories and service to keep your cargo safe, secure and with you!!! Click manufacturers' logos to see what's available for your vehicle. Copyright © American R.V. & Marine. All rights reserved.